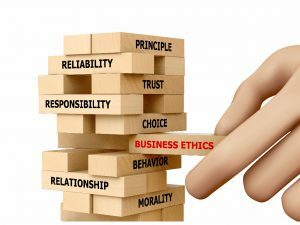 Is there such a thing as global business ethics? What are ethics? Often they are thought of by the public as an oxymoron – that business and ethics are incompatible. At least that’s the way it seems to many people. Ethics are about doing the right thing. They are about fairness and honesty and treating others well. They are about making difficult choices when these things conflict in real-life situations. Nobody wants to be treated unfairly. Some people will treat others unfairly so that they will have an advantage. so that they will “win.” People who have enough power can get away with this kind of behavior because they can control the actions of others even if the others have lost respect for them. We’ve just seen this with the expose’ of the behavior of Harvey Weinstein over the last several decades. There have been a number of ethical tests devised to help us make decisions about ethical situations. For example, what if you had to tell your mother about your behavior? or, what if your behavior was printed as the headline of the newspaper? In a business situation, a manager might be faced with a decision such as someone who is a friend and a subordinate being accused of sexual harassment. Often that behavior gets swept under the rug especially when there is an imbalance of power between the accuser and accused. This is why there are a number of laws to address workplace behavior and actions taken against whistleblowers. Yet there is still a long way to go with changing cultural workplace norms. In the global business arena the stakes can be much higher with worldwide trade and sales. We have seen some major issues recently such as Volkswagen being found defeating emissions testing for their diesel engines – and not just Volkswagen and its subsidiaries, Porsche and Audi but also Daimler and BMW(1). The managers of these companies knew that they were acting unethically, knew that they were defeating the intent of various countries’ desires to keep their populace healthy and reduce the effects of global warming yet they made an entirely monetary-based decision to do so. The idea of ethical behavior is that we humans live in a cross-connected society. What we do affects the lives of others. Do you or I have the right to perform acts that have a negative impact on others’ lives, health and well-being? Although these car manufacturers made decisions that positively (for a while anyway) affected the earnings and the stock prices of their companies, they cynically and fully consciously made those decisions knowing that they would affect the lives of their customers in a negative way. Quite often when the subject of global business ethics arises it is discussed concerning the fact that in certain countries it is necessary to bribe officials to get work done. The (usually) Western companies cry that if forced to follow ethical guidelines of the countries they are headquartered in they will be at a competitive disadvantage with other companies not so constrained. So, the question for you is, what constitutes your ethical boundaries? Is it necessary to violate the ethics of the culture you were raised in so that you can win on the world stage by playing by someone else’s ethical rules? Or do you maintain your personal ethical boundaries even if it means losing a big contract? In fact this is the kind of dilemma that often plays out in real life albeit on a much smaller scale such as the sexual harassment dilemma noted above.